Former F1 champion Jenson Button announced his full-time racing return in 2018. 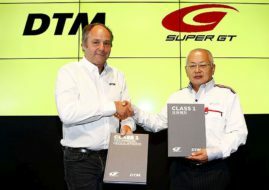 He will race with Honda in the Japanese Super GT Series. The announcement is made during the Honda Racing Thanks Day at Twin Ring Motegi, where Button signed a deal with Honda. For which team he would drive and who will be his co-driver, will be announced later. Button made a Super GT Series debut in August 2017, participating at 1000 km of Suzuka, the biggest Japanese GT endurance race. He was driving the #16 Honda NSX-GT for Team Mugen, sharing a car with Hideki Mutoh and Daisuke Nakajima. They finished in 12th place. “I’ll be racing for Honda and have a contract to race with Honda in Super GT in 2018. It’s been a dream for the last couple of years, I love the category. I did one race in Suzuka this year, and it got me very excited. I’m very excited about the new season. There’s a lot of testing to be done to feel comfortable and hopefully improve the package and go out next year and be competitive,” Button said.